Music for your child, and the child in YOU! Classes for your child....and the child in YOU! Winter Registration is NOW OPEN! Welcome to C.L.A.P. with Claire! C.L.A.P. with Claire is a music program that encourages children to Create, Learn And Play. Click HERE for WeeCLAP, my early childhood music classes! Click HERE for WeeElderCLAP, my intergenerational music classes! We have LOVED our C.L.A.P. with Claire experience! We have LOVED our C.L.A.P. with Claire experience! My Claire has loved learning and growing through this fun and very entertaining class. 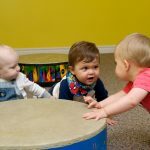 Claire uses amazing music and exposes the babes to all sorts of fun and exciting cognitive lessons through dancing and singing! This isn’t your typical baby music class. The music is great, the energy is high and fun and I have just as much fun as my little one, if not more! Scarves, balls, instruments and so much more! Cannot wait to sign up for the next round! C.L.A.P with Claire is the only music class I take my kids to! She is warm, inviting and soooo much fun! Amazing classes! Claire is fantastic with the kids and I LOVE the songs – most of them I know and not because they are baby songs which I’m thankful for. Strongly recommend this program!! In business for more than a decade, C.L.A.P. is located in London, Ontario. A mother of two, comic and a lover of music in all forms. OpenCLAP classes are BACK!! These drop in WeeCLAP classes will start up again on May 24, 2019. If you need to make up a class, contact me for your free promo code. New customers wanting to try WeeCLAP out for the first time can use promo code FREETRIAL to get their first class for free! And everyone else can get 50% off the regular drop in rate until July 15, 2019 using promo code 50OPEN!! C.L.A.P. with Claire shared a post. Happy Easter to you! Don’t forget… No classes today, Saturday or Monday. See you next week for our Sunshine theme! © Copyright 2019 C.L.A.P. with Claire. Preschool and Kindergarten by Rara Theme. Powered by WordPress. © Copyright | All Rights Reserved | Hosted & managed by iQWeb Solutions Inc.